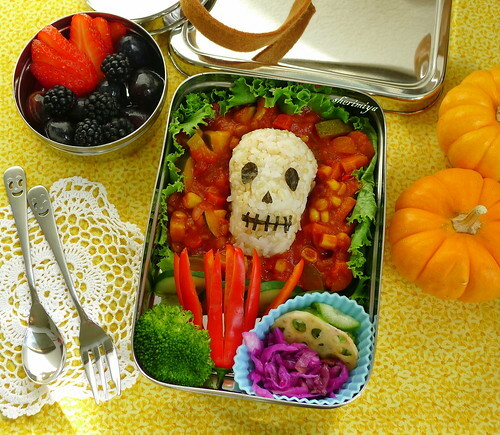 Skull Onigiri Chili Bento, a photo by sherimiya ♥ on Flickr. Are you getting into the Halloween spirit yet? I'm starting to... slowly! I figured it's time to start getting spooky so today I made a skull onigiri to go with the vegetarian chili (chock full of zucchini, corn, tomatoes, onion, carrots, and kabocha). I lay the chili on a lettuce leaf and put the skull on top. I made it kind of chunky so that there wouldn't be too much sauce to drip all over everything. I usually pack chili in a thermal jar, but I really wanted to use this cool new stainless steel Solo Rectangle box I got from EcoLunchbox. It's on the bigger side, simple and sturdy. I used a silicone cup, and these fit perfectly. They would be ideal for separating foods you want to keep apart. Besides the chili, I put in some cucumbers, a sprig of broccoli, and a mini red pepper. I put some homemade pickled cabbage, lotus root and cucumber in the cup. The lid to this box fits snugly, though not watertight, and I added an elastic band for extra insurance. Because I wanted to keep the fruit separate in case the chili moved around, I used an EcoDipper, a round lidded stainless steel half cup size container. Again, the lid fits snugly but I wouldn't use it to pack anything watery. It's perfect for a handful of fruit, though. This combo worked out very well for MisterMan. He swung his bag around, but since the silicone cup reaches the top of the box, the pickled foods stayed segregated. Although these boxes aren't leakproof, they are easy to use and should not pose a problem for your child to open and close. Having been a longtime user of Ecolunchbox products, when the company asked me to try out these newer products I didn't hesitate. I'm happy to share my experience with you, so you can feel confident before you decide to give these items a try. I've been packing bento for both a girl and a boy for almost a decade (wow! ), and I have a good idea about what works and what doesn't. I have more to share tomorrow, along with a giveaway! I hope you stop by! Love onigiri and love the skull. Beautiful food, Shiny new lunch bento, and gorgeous sun drenched photography! Sheri, you've got the Halloween spirit and so much more! Fabulous, can't wait to check out tomorrow's post!! Thank you berrygirl; you're so sweet. Yellow background will fool anyone into thinking it's a sunny day, even me! Have a great weekend! Thanks Heather; I hope you enter! i love this... the colorful presentation makes it very dia de los muertos for me! Oh yeah, I should have put flowers! Kabocha season, it goes into almost everything over here.